At the time they called it "The hallelujah weekend of Ireland", though the Irish Catholic Church had been ascendant for rather more than a weekend. For more than half a century the Church had been shaping the Republic. "After Ireland broke from Britain in 1922, it was a virtual colony to the Vatican, a theocracy in all but name." The future Archbishop of Dublin even played a central role in drafting the new country's constitution. In fact, Ireland was so solidly in the hands of the Church that Pius XII had hoped to make it a base for converting Europe, (a role that John Paul II would later assign to Poland). Twenty years later, there were signs that this bastion of the faith needed attention. The timing of John Paul II's trip was no coincidence. In the summer of 1979 the Irish legislature began the first tentative step towards legalising contraception  and that autumn the Pope made his visit. The pope’s homilies to the crowds insistently extolled the Virgin Mother, whom Irish women had been taught to take as their role model. 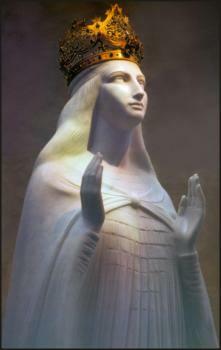 He visited the shrine of the Virgin in Knock, whose statue is demurely but unmistakably fruitful. ♦ At her shrine in Knock the pope intoned three times the biblical verse about Mary, “Blessed are you among women, and blessed is the fruit of your womb". ♦ Finally, the next day in Limerick he urged Irish women not to be sidetracked by any other goals. They should “not listen to those who tell them that working at a secular job, succeeding in a secular profession, is more important than the vocation of giving life and caring for this life as a mother”. He emphasised that this meant “a good Christian mother” and that the aim was not only the production, but also the evangelisation of children. For a time it worked. The number of births recorded in 1980 was the largest in Ireland in more than 80 years. “Ireland hit a perfect demographic storm.”  Members of this population bulge are known as “the pope’s children” and many of them are named “John Paul”. Finally, two years later, the Irish public showed that they agreed. In 2018 they voted in a referendum to repeal the article in the Irish Constitution which prohibited abortion, and it was removed form the constitution. (The government's proposed legislation was still restrictive, requiring certification from a doctor that 12 weeks had not passed, and a 72 hour waiting period.) As the results came in and it became increasingly clear that the Irish had voted to liberalise their abortion laws, flowers and messages were left at a mural put up in Dublin. This was to commemorate Savita Halappanavar, the woman who had died in agony while begging for an abortion for her unviable fetus. The end of the Pope's hallelujah weekend – a nightmare that lasted for 39 years – was finally in sight. IN GOOD CONSCIENCE: Conscience Clauses and Reproductive. Rights in Europe—Who Decides? Catholics for Choice, 7 October 2010. Marge Berer, “Ireland: The new abortion law – Protection of Life during Pregnancy Bill 2013” [summary and comment], European Prochoice Network, 2 May 2013. “European Court Rules Against Irish Abortion Law”, New York Times, 16 December 2010. “Catholic Church stands firm after Euro ruling on abortion”, Belfast Telegraph, 17 December 2010. “How Ireland Lost Its Faith”, Financial Times, 27 February 2010. “U.N. Committee against Torture: Ireland Must Ensure Access to Lawful Abortion”, Center for Reproductive Rights, 19 September 2011. 4. “Homily of Pope John Paul II at [the Marian shrine in] Knock, 30 September 1979”, The Pope in Ireland: Addresses and homilies, (Dublin: Veritas, 1979), pp. 53-54; p. 59. 5. “Homily of Pope John Paul II at the Mass for the People of God, Limerick [Racetrack], 1 October 1979”, ibid., p. 86. 6. David McWilliams, Dublin economist and author of The Pope’s Children: Ireland’s New Elite” (2005). Quoted in the New York Times, 25 January 2007. 9. “Experts say Ireland should clarify abortion laws”, Reuters, 2012-11-25.